Here’s still another way to enjoy fresh vegetables. I wanted to try an enchilada using mostly cauliflower–my new favorite vegetable to include when cooking. I’ve always enjoyed it plain, whether raw or cooked, but hadn’t used it as a supplement to different dishes. Since I discovered how versatile it is, I like to add it to anything. It somehow picks up the flavor of what you are cooking, adds nutrients and volume, and helps keep calories down. Cauliflower works so well in mashed potatoes, burritos, even fried rice. The enchilada contains a variety of vegetables besides cauliflower, all sautéed in a green enchilada sauce. It tastes fantastic. Another yummy way to eat a meatless meal that is tasty and filling. It’s also a great way to sneak some extra vegetables into your family meals. 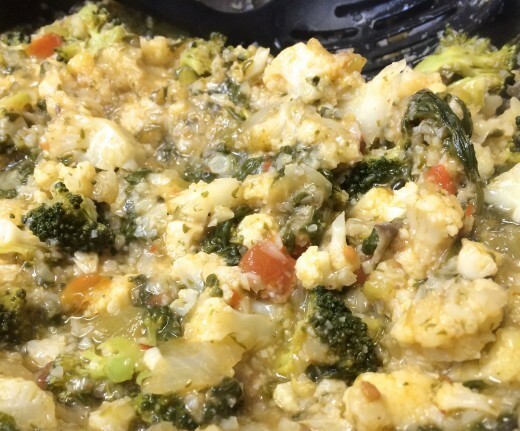 In this recipe, besides cauliflower there’s broccoli, spinach, mushrooms, and onions. Sauteed together in green enchilada sauce, it made a delicious mixture. The cheese melts and blends wonderfully as you bake it. One of the best things about home cooking is that you can add more or less of your favorite ingredients! It’s true with this recipe too. Add more of your favorite vegetables. Mushrooms or broccoli could be the main ingredient easily, cut into larger chunks, with the other vegetables adding variety and texture. Beans are wonderful blended in as well. Use red sauce instead of green, try cayenne pepper instead of chili powder…Whatever you like will work. Want something different still? Try this version that uses cauliflower sauce. It uses cauliflower sauce instead of enchilada sauce on the inside. 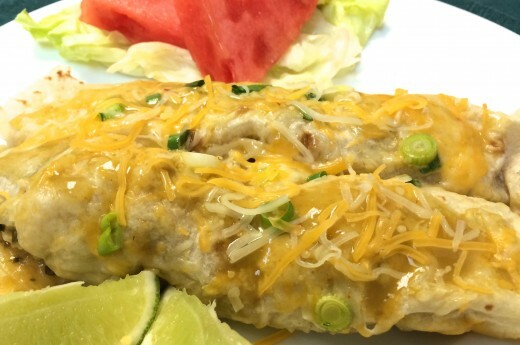 Often seafood enchiladas come in a white sauce. Come to think of it, if you are a fish eater, some shrimp would be delicious here too. This contains no seafood, but a light sauce sounded interesting. It seemed the perfect time to use cauliflower sauce. With the cheese and the chiles, it had plenty of flavor, though milder than the first recipe. You can still top it with enchilada sauce for a spicy boost. I think this is one even kids would love. Get creative, and let them add their own favorites to their enchilada. It always seems if they help create it, they own it and then eat it! Assemble all ingredients and prep all the vegetables. Heat oil in skillet, then add finely diced garlic and sauté until lightly browned. Turn heat to simmer/low, and add ½ can of enchilada sauce and blend while heating. Add the rest of the vegetables, the chili powder, and salsa. Cover and cook for 5 to 8 minutes, stirring occasionally, until cauliflower is softened. 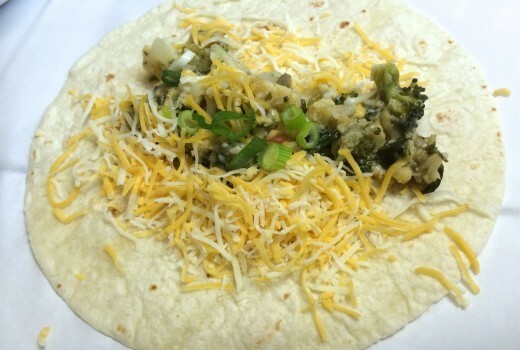 Sprinkle cheese onto a tortilla, then add scoop of cauliflower mixture. Roll the tortilla up snuggly and place in a greased baking dish. Repeat until mixture is gone. Spoon remaining enchilada sauce on the top of the enchiladas. Sprinkle with cheese and sliced green onion or fresh cilantro. Don’t let the number of ingredients stop you from trying this. It’s is so easy and so delicious. If you want to make it even simpler, use the Ninja Master Prep Professional. I chopped all the vegetables for this in seconds–literally. (except for slicing the green onions). It has to be the best small appliance I’ve ever owned. You can read more about it and see a bunch of in-action photos here.